﻿ Client of the Month: Elgin Contracting And Restoration Ltd. Client of the Month: Elgin Contracting And Restoration Ltd.
We are proud to present Elgin Contracting as our client of the Month for December 2016. Working with the team of Elgin Contracting in St. Thomas has been a wonderful and positive experience. The client specializes in general contracting with a flair for restoration of historical buildings. Elgin’s work extends all across Ontario. 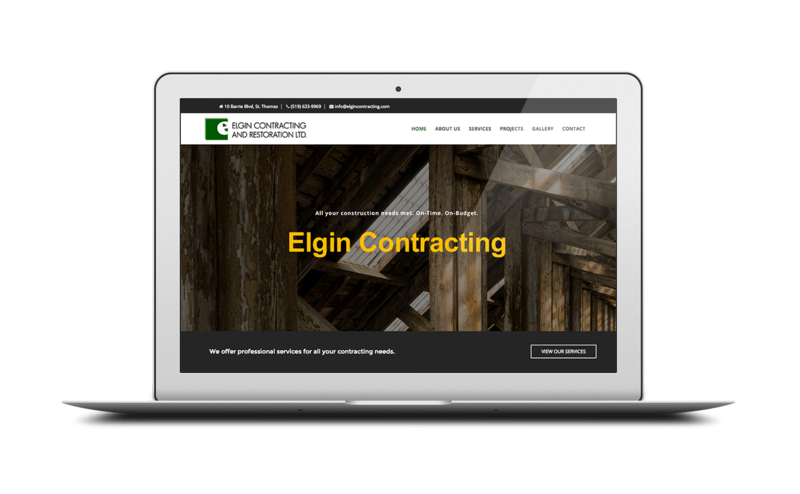 Elgin’s website was visually enhanced with current project photos and a statement of work for each was profiled outlining the work completed on each project site. Our goal was to showcase the extensive work and enhancements that Elgin Contracting & Restoration has done. It was important that we show Elgin’s capabilities and capacity of general contracting and restoration. The gallery section of the new website shows photos of their recent projects and takes you on a journey through their process of construction and restoration.